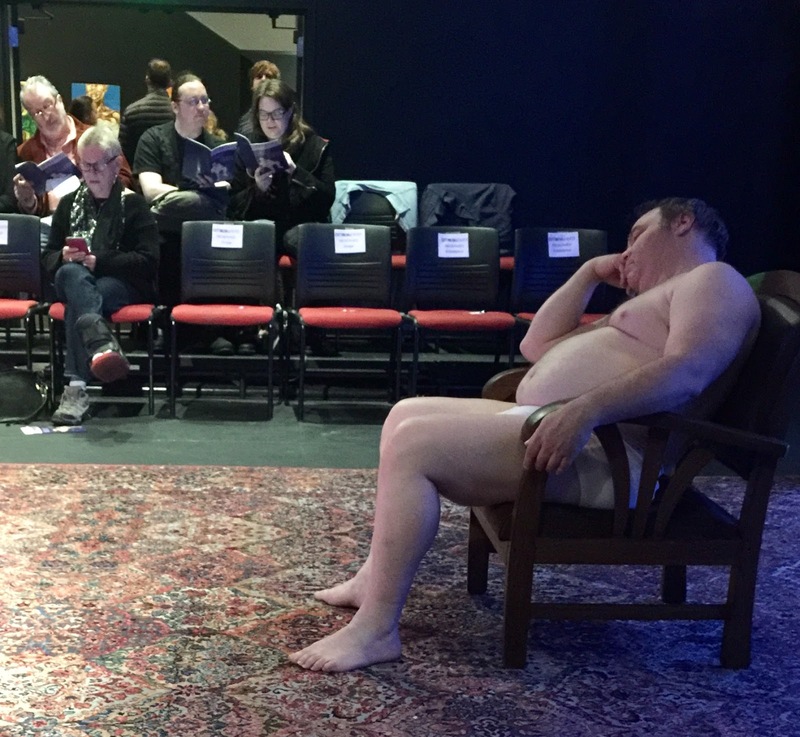 It’s hard to ignore the sleeping figure in his whitey-tighties slumped in an easy chair on the tiny stage of Cutting Ball Theater’s production of Anton Chekhov’s Uncle Vanya. 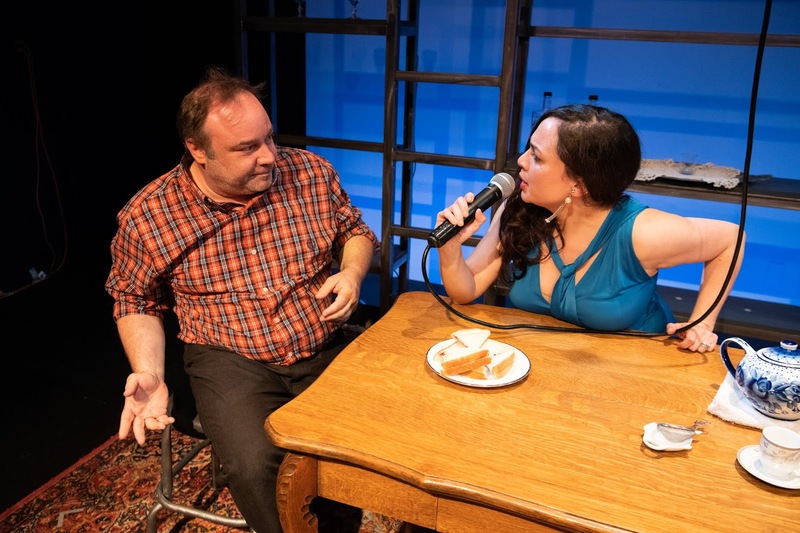 As the audience settles in, a shapely woman dances seductively to La Chica Mamey as the man, Vanya, enjoys brief, sweet respite from waking life. 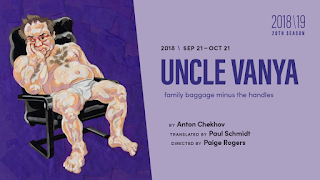 It’s a delightful way to begin Chekhov’s Uncle Vanya, a play about longing, dreams, disappointment, frustration, and attempts to find love, life and joy within the confines of a country estate. 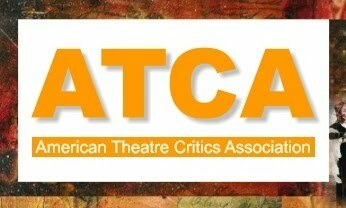 The set is instrumental in fleshing out the characters. 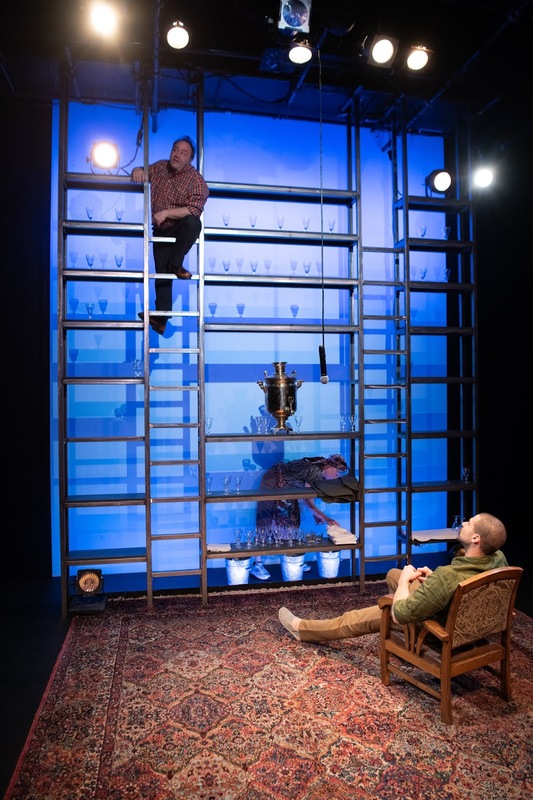 In its isolation, a country estate in the middle of nowhere is a type of cage, and the set design by Fred Kinney intensifies the feeling of entrapment. 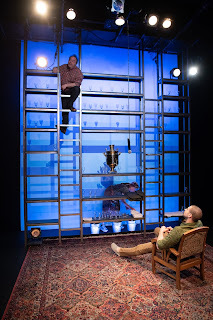 Two tall metal interlocking shelving structures, something that could be found at Ikea, extend the vertical space at opposite ends of the stage, allowing objects to be placed out of reach or walls to be climbed by desperate characters. On a higher shelf is a shiny samovar, and on the floor a rug, table and chairs. Two drop microphones are at either side of the stage, and they are gripped, swung, and nearly devoured by characters as they whisper or stress their lines, a brilliant technique to add emphasis and action to dialog. The estate’s been managed for years by Ivan “Vanya” Petrovich (George Saulnier, bringing a Wallace Shawn kind of openness); his niece Sonya (filled with desperate yearning by Haley Bertelsen); “Nanny” Marina (a fun and down-to-earth Nancy Sans); the innocuous and insipid Ilya Ilych Telegin, a.k.a. 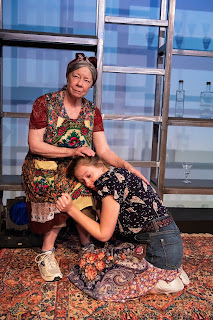 “Waffles” (played with a mousy near-invisibility by Merle Rabine); Vanya’s “Maman” (a cool Miyoko Sakatini); and the as-needed Hired Hand (Omar Osoria-Perla). The comfortable sense of order created by the routine of chores and meals at set times is disturbed by visitors: the pompous Professor Alexander Serebriakov (a distinguished yet whiney Douglas Nolan); his lovely young wife Yelena (played with sustained sensuousness by Virginia Blanco); and the uber-exuberant Dr. Mikhail Lvovich Astrov, who has been summoned to a futile mission to care for the professor’s myriad complaints of aches and pains. This play about the yearning for lost “life, youth, and happiness” vibrates with the charged interactions among the characters, each brimming with his or her own desire to reclaim a fading dream. 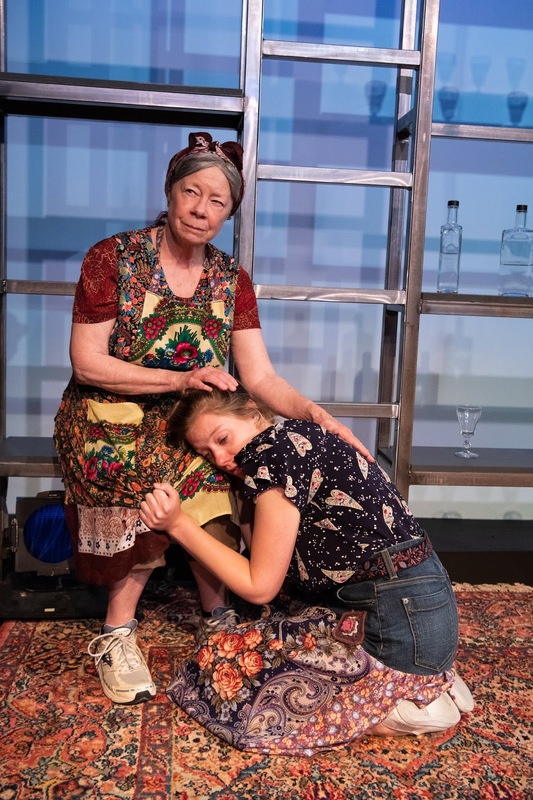 Director Paige Rogers has brought a sweet vulnerability to the characters, making this Vanya more modern and relevant in a way that really resonates with audiences. 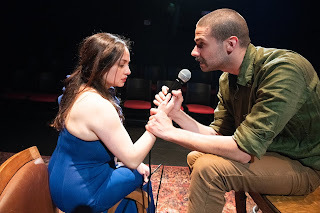 Vanya is revealed as a man of fervent appetites that are ignited by the young Yelena whom he urges to “wake up to the pulse of her mermaid life” and hopefully take him along, while in truth she prefers to wallow “morbid with laziness” in ennui and boredom. Such dreams are impossible when there’s work to be done, and Vanya is left with the anger at living his whole life for nothing, at having to work hard for nothing, of letting dreams die. 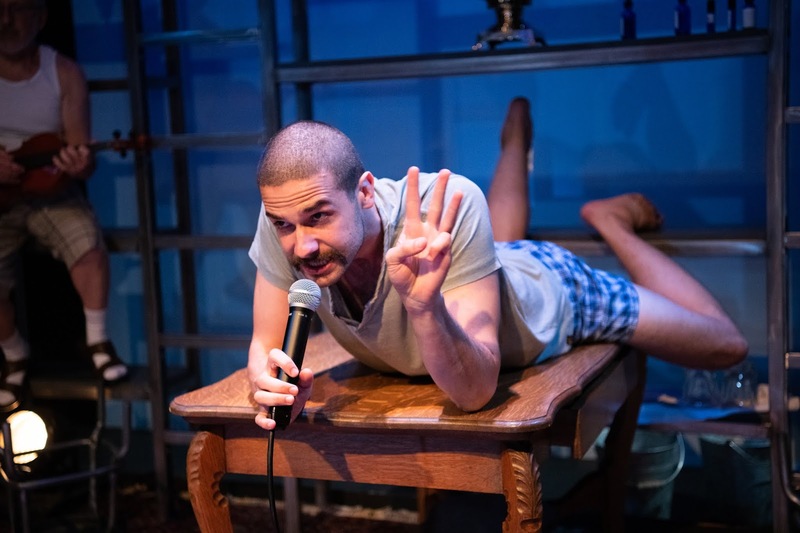 George Saulnier’s Vanya is a creature of habit, the lovable schlub who has put his dreams on the shelf as he exhibits an amazing emotional range from mischievousness to rage. Also delightful is Adam Magil’s Astrov, jumping around like a bird distraught by the small periphery of his cage, restless with his visions and desire to make a difference. Astrov sees the future in nature but is dismayed by human beings ”who must destroy what they can never create,” a sentiment that echoes our current woes. This most original production of Uncle Vanya is simultaneously delightful and disturbing, fun and fearful. You’re bound to feel right at home.